School of Everything meetup - this morning! A couple of weeks ago, one of our teachers - Tony Hall - suggested a regular School of Everything meetup in London. We thought this was a great idea, so this morning, Tony and I will be hosting the first meetup at the Southbank Centre. For me that would mean just taking my work down there and going mobile for the morning. Other teachers and learners, or anyone interested could come along and have open discussions about learning and teaching and School of Everything. This can be a completely open forum. As long as it is a regular place and time people will eventually come along, bring other people with them, and become involved in big discussions and specific conversations. So if you're in London and you want to join us, come along for coffee and conversation. Feel free to bring your work, your kids or anything else that seems appropriate. If you come into the Royal Festival Hall from the terrace above the river, we'll be in the main foyer area, past the bar and to the left hand side of the ballroom floor. I'll bring the big orange furry Every Thing, so look out for that - or, if you really can't find us, call me on 07810 650213. 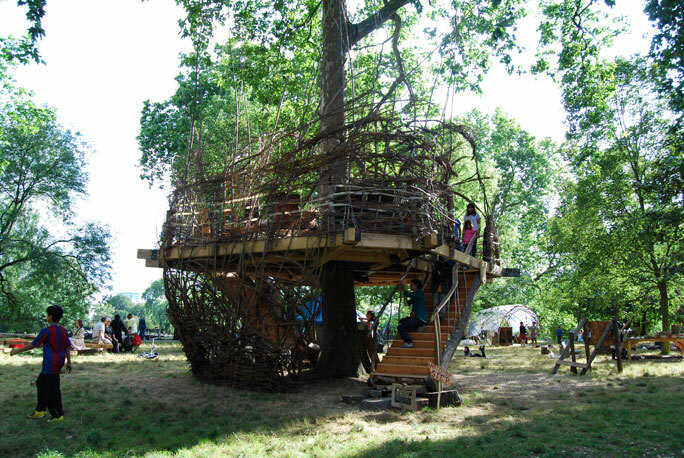 Come and teach in a tree! If you go down to the park this summer, you might get a big surprise - at least if it's Regents Park in London. A pair of large treehouses and a surrounding village have appeared beside the boating lake. The Treehouse Gallery is the work of some of the artists who organised the Temporary School of Thought, back in January, and over the next few weeks it will host all kinds of workshops, discussions and events. Lots of School of Everything folk have already been involved in the first couple of weeks of treehouse activities - the multi-talented Rachel Rose Reid was the star of the opening night, with her storytelling; while last weekend, our occasional psychologist-in-residence Tom Stafford gave a great talk on 'Technologies of the Mind'. This weekend, the theme is 'The Roots and Shoots of Knowledge'. On Saturday at 5pm, I'll be giving a talk on Ivan Illich's 'Deschooling Society', one of the books that inspired this site. Then at 6.30, we're hosting a discussion about the varieties of schooling, with speakers talking about their experiences in and out of the mainstream education system. There will also be workshops going on all day - and we're inviting any School of Everything teachers who would like to come down and give a taster lesson to join us! Or just come along and join in. Yay, we've now got a beekeeping teacher on School of Everything! His name is Sasha Mrkailo. The Bearfoot Beekeeper tells you how to keep bees the natural way, and here is a free PDF about sustainable beekeeping. Sweet as honey, ain't it. School of Everything has been selected as an entrant in the "Social Innovation" section of the Europas. (Being a greedy, award-loving lot, we would like to win it, so please go and vote for us! Now.) In the discussion below the list of nominees there is a good bit of healthy criticism about most of the selections and whether or not they actually fit into the category. Dejan Strbac from aleveo.com asks why "aggregation of teacher ads" is seen as social innovation. He has a point. We know it. The sound of ideals smashing against reality is not pretty. Grand concepts are never easy to bring into being. School of Everything was founded on extremely lofty goals - we wanted to change the face of education. We are still pursuing our grand ideals, but we are also very aware of how much work is involved in reaching them. We would love School of Everything to make a difference to society. It is very important to us that our work is more than just a commercial enterprise - but it is just as important to us that it is a commercial enterprise. 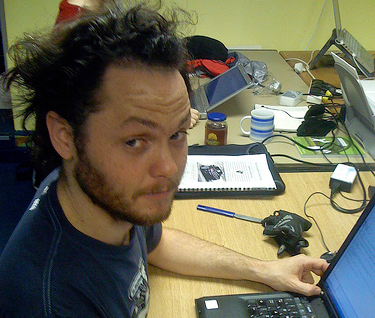 At the moment we are hard at work building the tools that will allow us to survive as a project. If we can sustain ourselves in the market, then we have proof that our work solves a social need. With a foundation in place, we can safely pursue the next steps of our plan. The sound of ideals being brushed under the carpet? I am also very open to the argument that we have strayed too far from our vision. Simply building a tool that makes change possible is not the same as making the change happen. Perhaps we have been too quiet about our big idea, or does it make sense to quietly go about changing things step by step? Education needs to change. In its current form, School of Everything plays its part by making it a little easier for those who are pro-active about learning to find people to teach them. Maybe it's a baby step, but it is in the right direction. We have a mountain of plans for the future that will reach way beyond where we are now - but first we must get the basics right. There is nothing like the sound of ideas forever lost in the clouds. If we are going to truly be a social innovation, we have to think in the long term. We have to be practical and pragmatic. A website can only be a tool, one tool among many. The real innovation we want to achieve is in the way society thinks about learning. Education is not a product of mass production, it is an active journey, an adventure into new and unknown territories. Education is not a spectator experience, a choice of brands to be consumed. We learn best by participating, by being involved. The innovation we hope to inject into the fabric of society is this: Everyone has something to learn and everyone has something to teach. If you can help us on our way, we would love to know of your ideas. At the weekend, half of Team Everything headed up to Glasgow, bonnie Scotland to take part in the third SI Camp - so we thought we'd do a city showcase of School of Everything teachers in the area like we've done with Sheffield and Newcastle in the past. As you can see from Sangeet's graphic the most popular subjects are Driving, Dance, Guitar, Scottish Harp, Singing, Chinese - Mandarin, Tai Chi, Jazz, Yoga and Cheerleading. Mishra is an elegant professional belly dancer. Her style is infectious, energising, whilst expressing the emotions of the story of the song. Becks Armstrong is a certified doula and birth educator who has attended more than 75 births of all types. Daisuke Tani teaches all things Japanese - language, massage and cuisine. Karen Marshalsay performs on gut, wire and bray harps and can teach any of these instruments, and is also active as a composer. Celebrating its 14th year in 2009, the West End Festival brings families, friends and children together to celebrate the community spirit and cultural diversity of Glasgow’s West End, with over two hundred events crammed into two weeks of carnival entertainment. We made a visit to the Mitchell Library and left feeling inspired. It is a lovely place. We want School of Everything to be as good for all you teachers as possible, but how can you get the best out of your teaching profile? Well here are a few tips from Everything HQ to help bag loads of students. What do you look like? Perhaps most important is to put a good picture on your profile. It makes it 5 times more likely that people will click on your profile. That's a good start isn't it? Tell us a little bit about yourself. Don't give your life story but filling in this section on your teaching profile helps students decide if you're the teacher for them. Where are you? Setting your location is very important. Make it as local as possible because all search results are sorted by location first. This is important for cities such as London. What do you teach? Choose the simplest way of explaining the subject you teach. When adding subjects to your teaching profile it is better to add them separately. i.e. 'French'; 'Spanish' rather than 'French and Spanish' We now automatically show related teachers and subjects (ask Russell from Team Everything about Matchy Matchy). Keep in touch. There are a number of ways for students to contact you through School of Everything so make sure you're set up for them all. Have you sorted your Marketplace settings? Well you should. Spread the word. Why not put the link to your School of Everything profile in your email footer? The more you link, the more Google loves you; the more Google loves you, the higher up in Google searches you get; the higher up in Google searches you get, the more people see your teaching profile; the more people see your teaching profile, the more students you get; the more students you get, the happier you get. That's most important. Phew. Now, over to you - you're the teachers and you know best. What tips do you have to share with other School of Everything members? Add a comment. Please and thank you. Paul is in Newcastle at Thinking Digital, so we thought we'd do a city showcase of School of Everything teachers in the area, like we did with Sheffield last week. As you can see from Sangeet's graphic the most popular subjects are Driving, Saxophone, Tai Chi, Guitar, Science, Qigong, Self defence, Maths, Jazz and Music theory. Ivy Taylor has been DJing for 7 years, specialising in Turntablism. She scratches, beat juggles and creates intensive mash-up routines. Nick Able is a professional Musician, Composer and Teacher who runs a studio and teaching practice from home. Sarah-Jane Miller is a folk and traditional music teacher - singing, ukulele, penny whistle and much more. EAT! 2009 - sixteen days of edible activity. For cycling enthusiasts there's the Northern Rock Cyclone Challenge. Join WILDWORKS on a stirring outdoor adventure on the banks of the River Tyne where the old certainties have melted away like the ice. Dougald was in Sheffield yesterday so we thought we'd do a little city showcase of School of Everything teachers in the area. As you can see from Sangeet's lovely little graphic, the most popular subjects are Driving, Piano, Maths, Digital Photography, Yoga, Guitar, Drums, Jazz, Violin and French. Luke Bradley is a young and ethusiastic Maths tutor who started tutoring GCSE students whilst studying for his A-levels. "It was relatively informal but something I vowed to take up again in the future as I enjoyed it a great deal." Elton Clough has been hairdressing for 35 years and loves creating highly individual styles. Nice profile picture. Learn for Life Enterprise is a community organisation based in Sharrow. Take a look at their teaching profile for a wealth of public classes in a range of subjects. Nigel Townsend is a Wood Enthusiast who says "I love being outside. I love nature. I love making things out fallen nature." There's also lots going on outside of School of Everything of course. Just take a look at Sheffield Forums to get a feel for how vibrant the scene is. Fancy learning about edible wild plants and how to identify them and use them in traditional recipes and to make herbal remedies? This workshop led by local herbalists might be for you. This year's Music in the Round Festival runs from Friday 8 - Saturday 16 May, celebrating the work of Johannes Brahms, one of the most prolific and influential composers in chamber music. And finally, the SCM are a mob of crafty so and so's from the Steel City promoting craft and creativity. Some of the craft mafia members will be holding a Spring craft fair at the Basement on West Street, Sheffield on 16th May. That's a bit more accurate. We're a tiny team so coming to work with us will involve mucking in and helping out on all kinds of things. We've had some great interns over the past year who have worked on everything from research to marketing to taking some amazing photos of School of Everything members. If you'd like to follow in their footsteps and get a feel for start-up life, there are more details and information about how to apply on our jobs page. 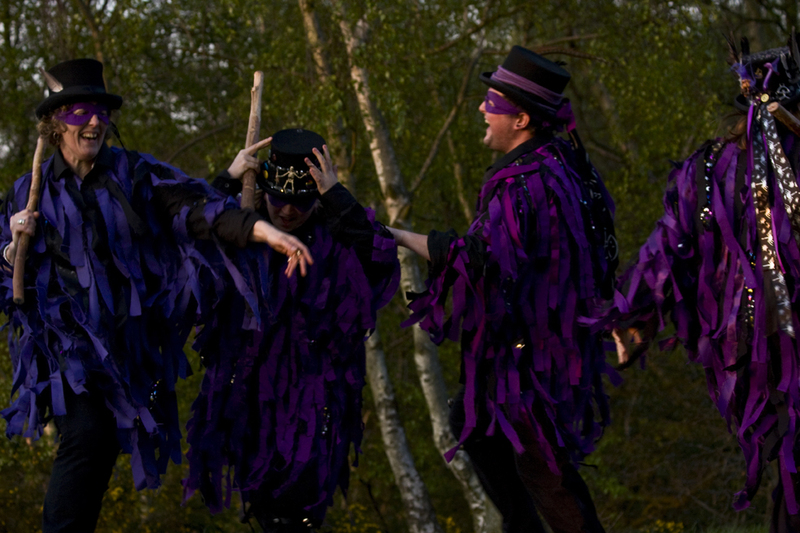 Anita Lasocka, from the BA Digital Photography Course at London South Bank University has just visited Everything HQ with some of her photographs of School of Everything Morris Dancing classes. 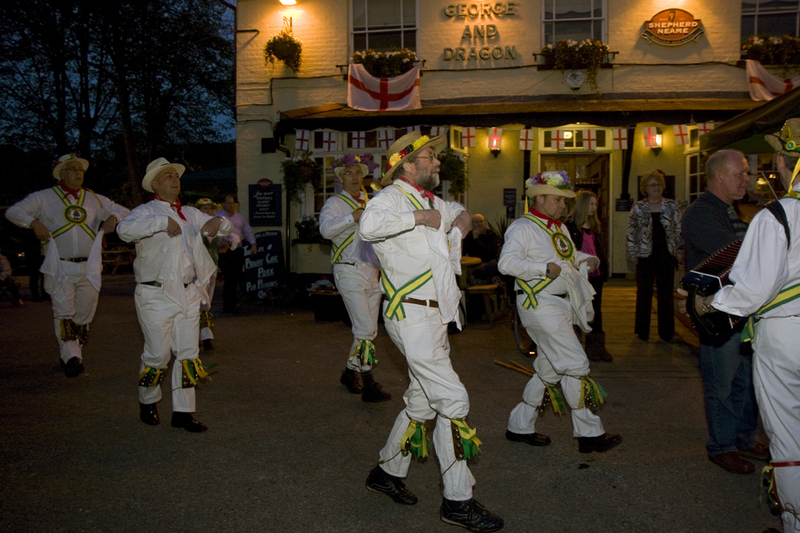 Here's a taster showing Spring Grove Morris Men and Bacchus Border Morris in action.